We all need quick and easy side dishes this time of year. Whether we're hosting feasts or bringing something to a pot luck, it's a nice thing to have a few simple recipes on hand to whip up in advance or in a hurry with minimal fuss. 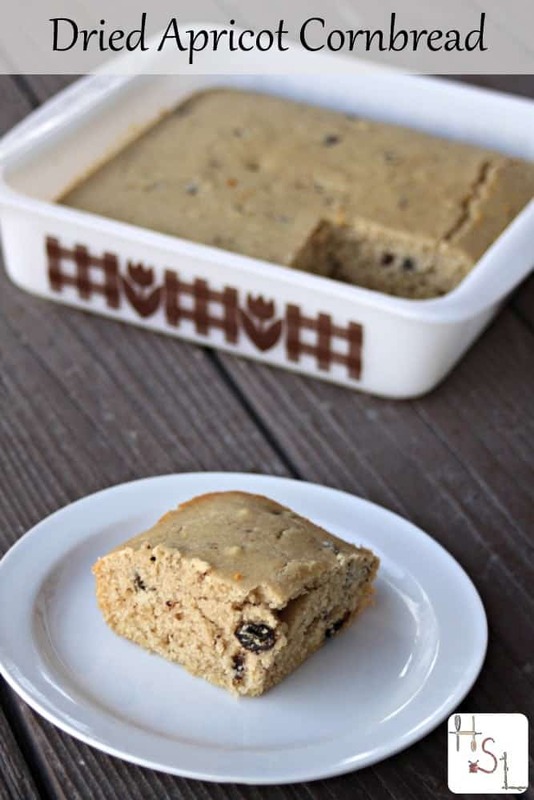 This dried apricot cornbread is one such recipe. It cooks up easily and can easily be doubled to feed larger crowds. Before beginning this recipe let's talk about dried apricots. Home dried apricots tend to be drier than the store-bought ones that tend to be more supple. Soaking them first makes them easier to chop. Weighing the dried apricots seemed the best way to ensure a uniform amount in the final product. To give this bread more apricot flavor and sweetness, use the soaking water from the apricots. Because different apricots will absorb different amounts of water, measure the water after soaking and add more milk to get 1 cup of liquid. Alternatively you could just skip the soaking water and add 1 cup of milk. While dried apricot cornbread is delicious served alongside dinner, it is also mighty tasty fried in a little butter alongside eggs for breakfast. Whip up this dried apricot cornbread for a quick and easy side dish perfect for holiday feasts. Preheat oven to 350 and grease an 8" square pan. In a small saucepan, combine dried apricots and water. Bring to a boil and simmer 5 minutes. Cover and remove from heat. Allow to sit for another 5 minutes. Drain reserving soaking water. Chop the apricots into bite size pieces and set aside. Measure the soaking water and add enough milk to have 1 cup of liquid. Return the liquid to the saucepan, add the butter and honey. Heat just until butter is melted and honey melted. Stir well and set aside. Whisk together the flour, cornmeal, baking powder, and baking soda. Pour the liquid into the dry ingredients and stir. Add the beaten egg and chopped apricots, mix until thoroughly incorporated. Pour into prepared baking pan and bake for 20 minutes or until inserted toothpick comes out clean. The idea is based on an old-fashioned potluck dinner party. Each blogger is bringing one or more dishes to the party, so be sure to stop by each one and get some ideas for your own Thanksgiving meal. We’ll be posting to social media with the hashtag #blogsgivingdinner, but you can see all the whole menu in Part 1 and Part 2 of the recipe round-up. This looks amazing, Kathie! I love dried apricots (and dried fruit in general) but I’ve never thought to put it in cornbread! That is such a great idea. Thanks for being a part of Blogsgiving Dinner! 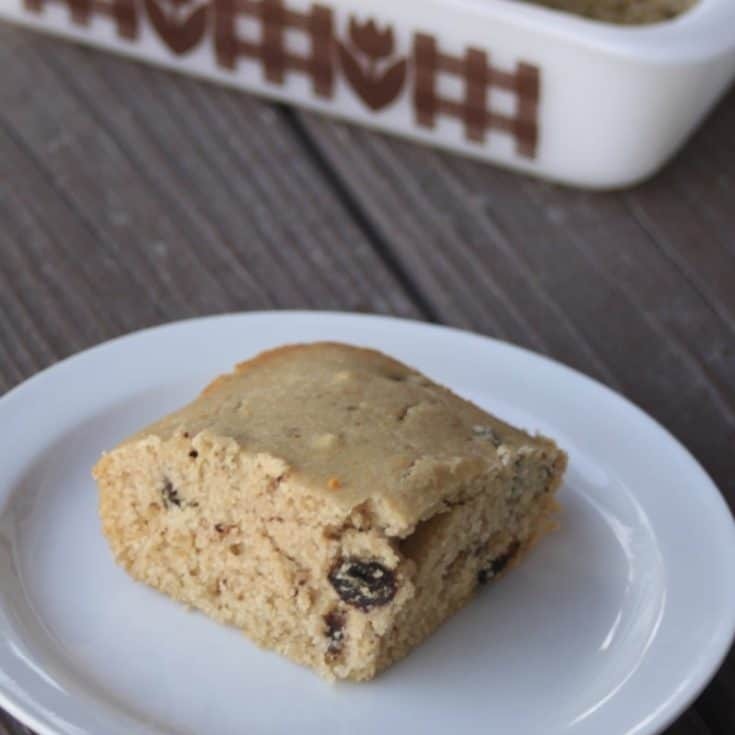 I adore cornbread and never thought to add dried fruit–I bet it brings such a sweet flavor to this!